Fruits and raw food are infused with maximum life force energy. They comprise what is called ‘Amrit Bhojanam’ in Shiv Yog. Consuming more fruits in the diet helps increase the Pran Shakti in the body, provides adequate life force energy to the cells and keeps an individual young for longer. At Shiv Yog, the Guru calls for every Shiv Yogi to undertake the sewa of distribution of food to the needy as a service, as a duty and as an act of compassion. When hunger is satisfied, the vibrations of satiation emitted by the consumer of the food reach the one who became a medium for the food to reach the beneficiary, helping him ascend and evolve. 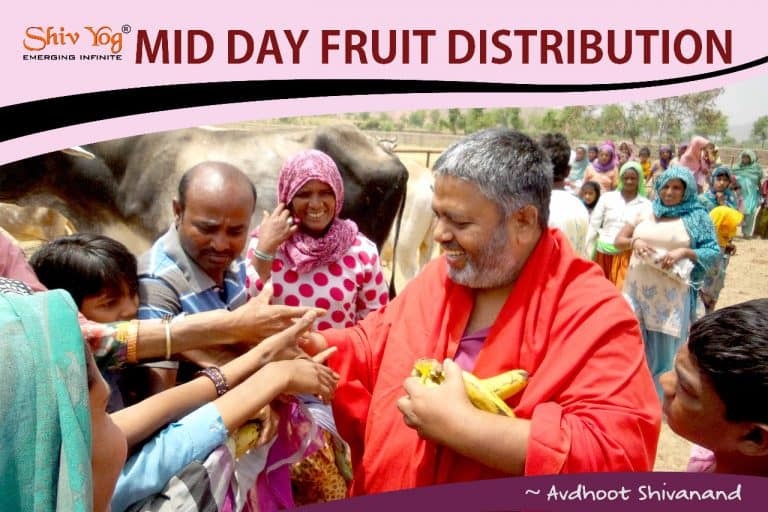 In Alwar, Rajasthan, Humanitarian Dr Avdhoot Shivanand through Shiv Yog Selfless Service initiatives, and with the help of Shiv Yog volunteers, has been distributing fruits weekly to all the needy rural folk. Shiv Yog says you too must feed “alive food” to all the needy around you on a regular basis as a Nishkam Sewa.